Cook oatmeal per instructions on the packaging. 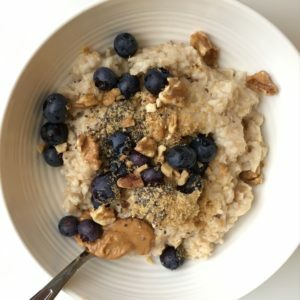 Top with blueberries, oatmeal, and walnuts. Substitute peanut butter with almond butter or walnuts with chia or pumpkin seeds based on preference. Make up a large enough batch of oatmeal to place leftovers in a glass container for a quick and easy reheat the next morning. I prefer to reheat on the stovetop with coconut oil and cinnamon. I actually love reheated oatmeal cooked this way, so I will sometimes cook the oatmeal at night for a really simple & tasty morning breakfast.